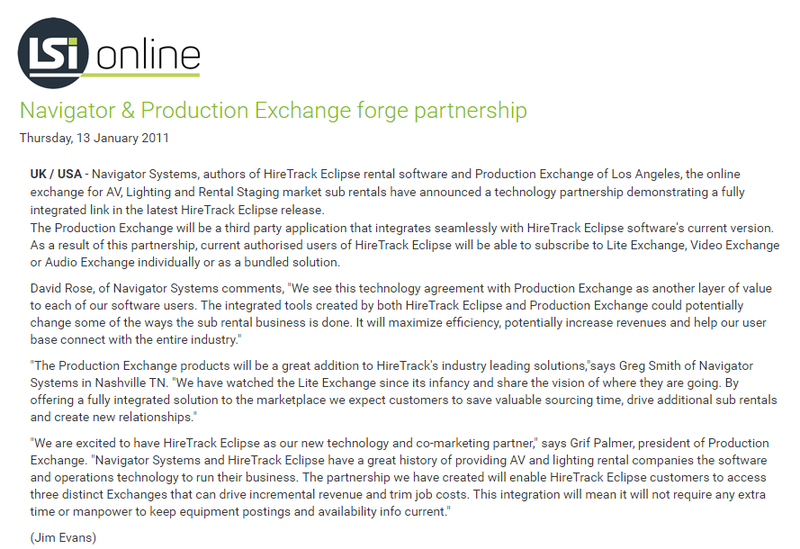 UK / USA – Navigator Systems, authors of HireTrack Eclipse rental software and Production Exchange of Los Angeles, the online exchange for AV, Lighting and Rental Staging market sub rentals have announced a technology partnership demonstrating a fully integrated link in the latest HireTrack Eclipse release. The Production Exchange will be a third party application that integrates seamlessly with HireTrack Eclipse software’s current version. As a result of this partnership, current authorised users of HireTrack Eclipse will be able to subscribe to Lite Exchange, Video Exchange or Audio Exchange individually or as a bundled solution.